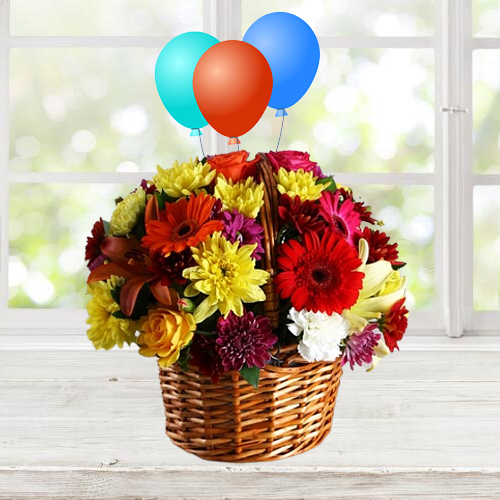 Gift your dear ones with Colorful Bouquet of Beautiful Flowers and Bright Balloons Filled with Happiness so that they feel very special. It will create a special feelings on your loved ones heart. Flowers Delivery Kapurthala, Send sweets Namakkal, Wedding Cake Kanchipuram, Diwali Mithai Kasargode, Send Flowers and Gifts to Tiruchirapalli, Online Shop Secundrabad, Flower to Bellary, New Year Flowers Hyderabad , Fresh Fruits Raipur, Send Gift Rajamundry, Dry Fruits to Ghaziabad, Birthday Delivery Dharward, Sending to Ambala, Flower shop Tanjavur, Palghat Online Cake Delivery.